Woodlands Country Club is one of the best kept secrets in South Florida. Our Grand Ballroom is 6,500 sq. 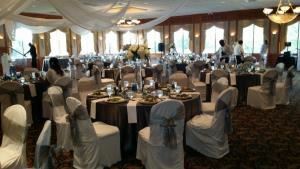 ft. and can accommodate up to 300 guests with the 650 sq. ft. dance floor open, and 350-400 guests without a dance floor. We have both indoor and outdoor ceremony locations, and a large cocktail area with bar for cocktail hours. We are open to the public 7 days a week. Please call for more information or to request a tour.